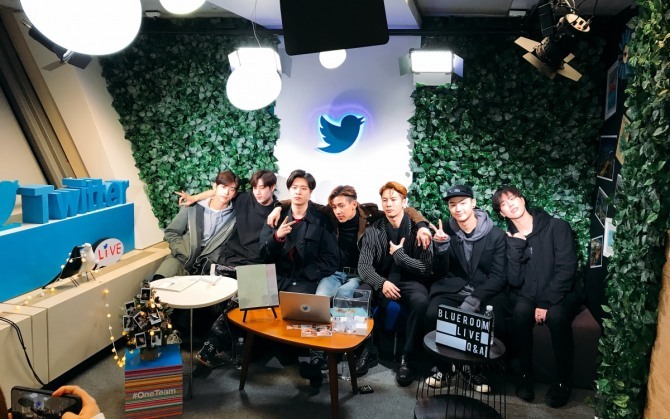 Following the release of its new album “Present: You & Me” on the previous day, GOT7 hit Twitter’s Blueroom Tuesday evening. The social media giant’s live Q&A program was held at its forest-themed studio inhabited by Twitter’s iconic bluebirds. 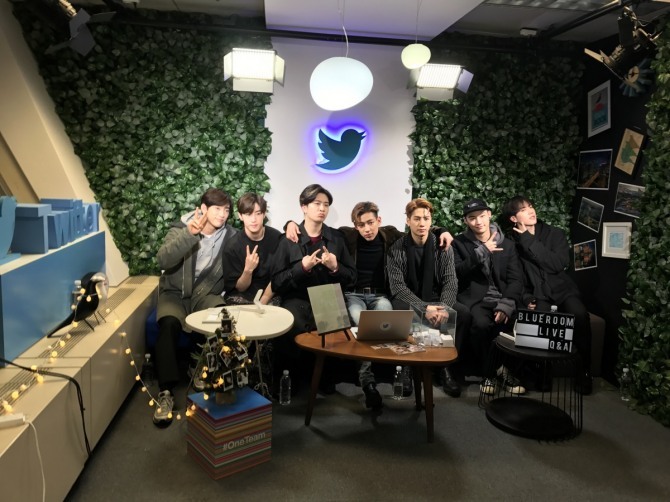 GOT7 arrived at the studio one by one from about five to 10 minutes before the live broadcast’s official kickoff at 7 p.m., and the cozy microstudio soon became crowded with the seven bandmates’ presence and energy. As they walked into the room, heads turned. Twitter Korea’s head of global content partnerships, Kim Yeon-jeong, greeted and led the band into the studio. GOT7 seemed perfectly at ease, exchanging lighthearted banter with staff inside the studio. Before the septet’s arrival, the Twitter Korea crew busied themselves around the room, readying props such as cardboard cutouts of tweets, hanging Polaroid snaps of the band from the miniature Christmas tree as ornaments and setting up bluebird-branded electronic devices to read tweets from. While the side of the studio shown on air may be its prettiest bit -- with the GOT7 members seated in front of an ivy-covered wall, the lighted bluebird logo afloat over their heads in the background and a tiny Christmas tree and lights for the season -- the snug display certainly belied the extravagance of the setting. Situated high up on the 41st floor of a skyscraper in Seoul’s southern district of Gangnam, Twitter Korea’s office is as fancy as it gets -- a venue befitting of the superstars. It was easy to see GOT7’s beloved status among the Twitter crowd. Muffled chuckles and mouth-covering laughter broke out constantly from staff from behind the camera. When the live broadcast came to its promised three-minute break, as the music video to the new song “Miracle” played, the group was occupied looking up tweets, fascinated by the rapid influx of new messages. “I was looking up GOT7, why am I getting all this random stuff,” Yu-gyeom wondered aloud. When Kim announced to the band that the broadcast had hit 300,000 viewers, GOT7 burst into a chorus of “wows,” genuinely surprised. “I don’t know what we could have done to have so many people watch us,” said JB. About an hour into the broadcast, the boy band left it up to Youngjae to wrap things up with closing remarks. One of the masterminds behind Twitter Korea’s signature event, Kim had spent the hourlong broadcast watching over the show like the conductor of an orchestra as it unfolded. Of course, no gathering can truly be complete before the mandatory group photos. Twitter employees and GOT7 posed for selfies to commemorate the evening. The band then finally exited the studio with polite bows. 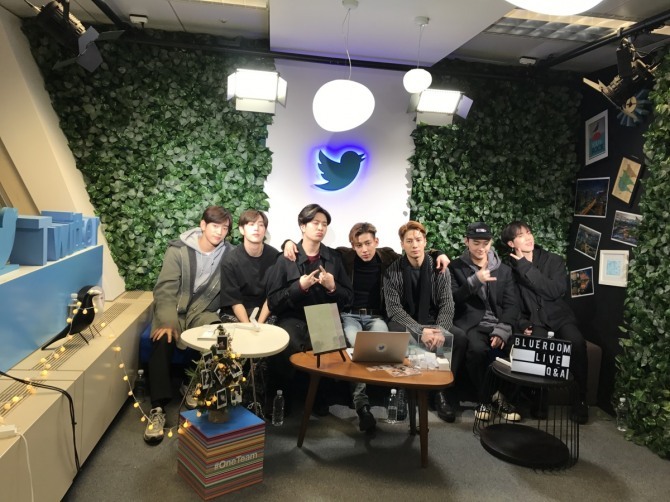 According to Twitter stats, GOT7’s Dec. 4 Blueroom segment recorded 870,000 viewers, 23,056 retweets and 28,387 likes by the broadcast’s end at 8:10 p.m.